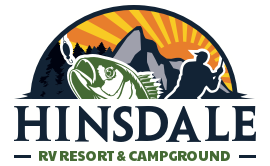 Hinsdale RV Resort & Campground Welcomes You! Enjoy a relaxing outdoor vacation at Hinsdale RV Resort and Campground in southwestern New Hampshire. On 200 acres above the Connecticut River, we are just four miles from Pisgah State Park. Full Service: Large, level sites on wide streets with space for slide-outs, 30’ by 60’ long with a 60- degree turning ratio. Excellent for large groups, families, weekend or seasonal campers. Pop-Up Campers: Our pop up / camper sites offer spacious accommodations, similar in size to full-service sites. Each site comes with a lamppost, a fire ring, and a picnic table with benches. Wilderness: Enjoy a hearty meal cooked over the campfire under the open sky! Our amenities include two pools, a modern bathhouse, a multi-use pavilion and much more! Nearby activities await your participation, especially if you like outdoor rejuvenation, like boating, fishing, golf cycling, hiking, and biking. Hinsdale area attractions such as sumptuous restaurants, niche shopping, and lively entertainment are all close to the resort. Large clean bath house/restrooms. Nice area of town. Accommodating staff. Very clean, great pool area, children’s activities, best bathroom facilities I’ve ever seen at any campground, and I’ve been to a lot. Definitely going to be a returning customer. This is a beautiful little area with many fun activities to do. The area is very scenic and relaxing. This place has room for kids to play and adults to relax!